Stephen Malkmus has released “Come Get Me,” the third single off his forthcoming solo album Groove Denied. 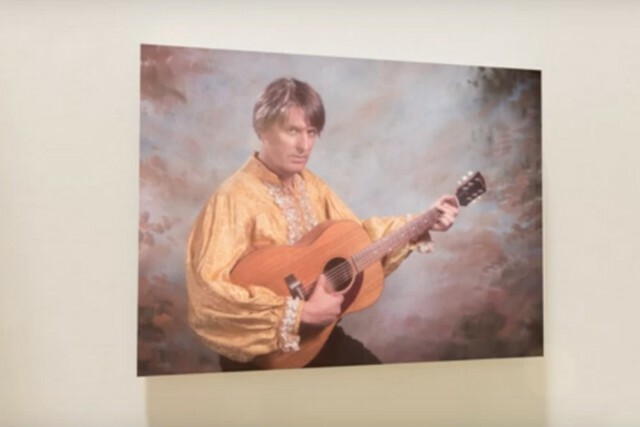 The accompanying video provides a tour through a museum dedicated solely to Orlan Mills-style portraits of Malkmus as he dons various personas, including a parody of a seductive troubadour brandishing an acoustic guitar, and paintings of the singer-songwriter looking like a middle-aged suburban hipster dad in aviator-frame glasses and a canary yellow Fred Perry sweater. As the camera pans through the gallery, the viewer is confronted with the many faces of Malkmus along with animated lyrics appearing under each portrait. Keep an eye out for a portrait of Malkmus rocking a bolo tie. The video was directed by Marisa Gesualdi and the photos are courtesy of Robbie Augspurger. “Come Get Me” is more of a straight forward indie rock track than the previous two pre-release singles from Groove Denied. The previous single, “Rushing the Acid Frat,” was a psychedelic jaunt, and the first single, Viktor Borgia,” saw Malkmus indulging his fascination with synths and drum machines. So far, Malkmus’s fundamental breezy songwriting is still front and center regardless of the instruments he’s using. Groove Denied comes out on March 15 and can be pre-ordered here.